So since DC has been buried in snow I have not have the means to go grocery shopping meaning no new exciting recipes to post about soooo I took a vacation, but I am back! Now if I had to pick a favorite ethnic cuisine I would have to say Indian food, especially the vegetarian recipes, especially anything with potatoes. Indian food has the best spices and it just fills the air with a nice warm aroma. It’s 31 degrees F outside it felt like a balmy 80 in my apartment, which is perfect to keep me warm since my Valentine is not around to keep me warm tonight. So I’ll stop blabbing now and give the recipe. It’s a modification of Emeril Lagasse’s recipe, I didn’t really like how he make it all mush so I kept my potatoes in chunks and crisped them up. I’ll give you another variation I’ve done on this as well in case you don’t like the thick texture of the spinach portion. 2) In 1 1/2 tablespoons oil cook onion, garlic, ginger and jalapeno pepper; cook until onions are soft. Add spinach in batches and wilt down. Once all spinach is wilted. Put in a food processor and puree* OR add potato chunks to spinach now. Add garam masala, cumin, and cayenne pepper. Cook until crisp. Stir in heavy cream and serve. 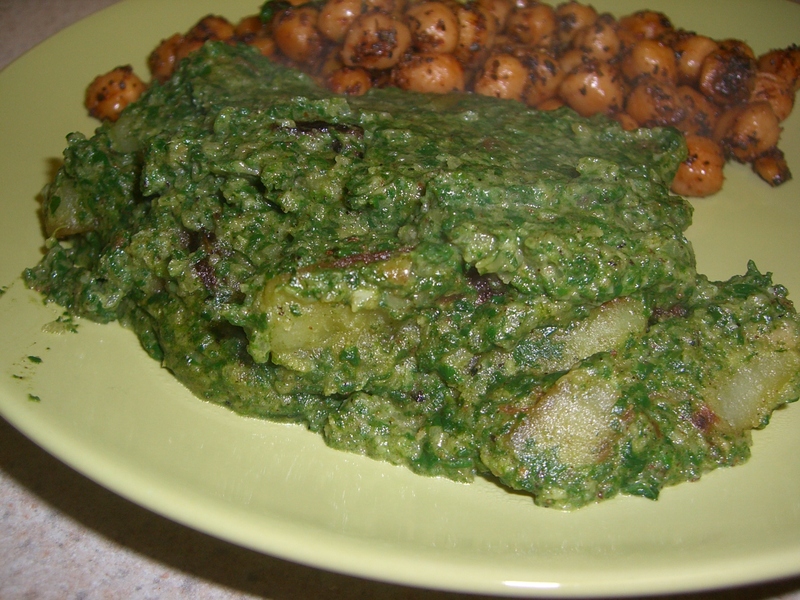 *3) Saute potatoes in skillet where spinach mixture was cooked. Add all the seasonings (garam masala, cumin, and cayenne pepper) now. Add a bit of oil to help the potatoes crisp up. When potatoes are crisp add puree spinach mixture and heavy cream. Give it a good stir. If you go to the link to the Emeril recipe there is a tasty spicy chickpea recipe. I didn’t make any changes to it so just eat it as is! Also, get some naan to get with this. It tastes great wrapped up in a warm piece of garlic naan. You can find pre-made naan at the grocery store I always get mine from Whole Foods. So I think it is fairly obvious I’m not the best of bloggers. I have issues with keeping a schedule, but never fear I am still here and still cooking. So having ground chicken left over from the stuffed peppers I had to do some quick thinking of how to use it up so it didn’t go to waste. Cooking for a small crowd, meaning 1 or 2, is difficult when it seems like everything you buy comes in bulk portions. So you find yourself a) using it all at once and ending up with bazillion of leftovers or b) you end up finding that meat,produce, fruit item you meant to put to good use in another recipe transforming into a UFO in your fridge. I had leftover ground chicken. I also had a taco flavor craving, but I didn’t actually want tacos, if that makes any sense…. 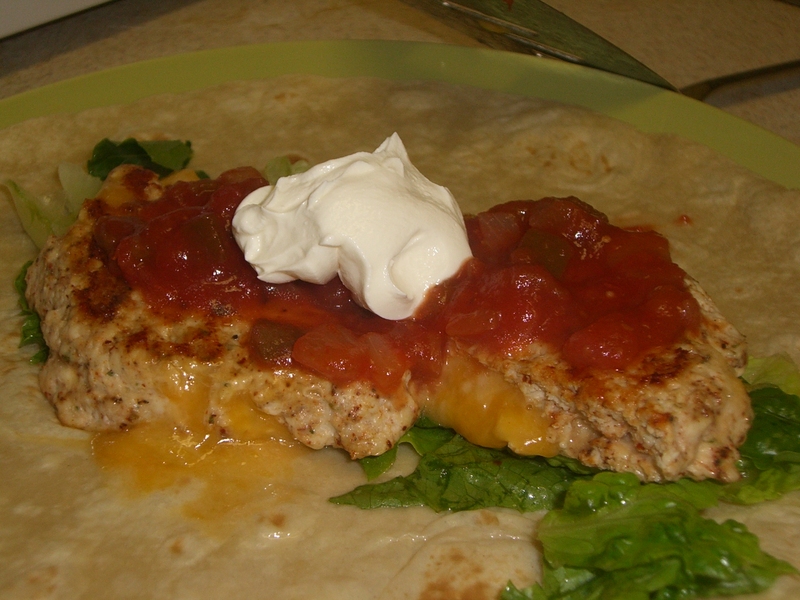 So to satisfy this craving I decided to make an inside-out taco chicken burger. And to make it extra special I decided to make my own taco seasoning. So brace yourself for taco chicken burger awesomeness and bask in the happiness of knowing you can make bazillions of these burgers, freeze them, and enjoy them in less than 10 minutes whenever another craving strikes. Enjoy! 1-2 tablespoons DIY taco seasoning, recipe follows. Put ground chicken meat in a bowl. Mix with taco seasoning. Divide the ground meat into portions of 3 or 4 depending on desired burger size. Measure out your cheese now so you don’t contaminate it with chicken hands by reaching into the bag. Burgers are ready to be cooked or frozen! If you freeze them I recommend plastic wrap first and then foil. When you go to cook them later no need to defrost just cook straight from frozen. Just make sure not matter when you eat them the temperature gets to at least 165 degrees Fahrenheit internally. So as promised here is the all exclusive post about basil. It truly is a wonderful herb. Fact of the matter is I use a lot of basil. For awhile I was foolishly buying the “fresh” basil in the little plastic cartridges on a needed basis, but those tiny little packs of not-so-fresh basil cost a good $3.00 and don’t last nearly long enough for all my basil cravings. Luckily, grocery stores have a solution for people like me and they now sell live plants!! I will confess my first shot at the live plant did not go over so well and I had to throw basil #1 away, but basil #2 is flourishing! Don’t believe me? Look at this! So as you can see I had a lot of basil on my hands. SO much basil in fact I made my dishes for the week center around the fact that I had basil. In the following you will find just a few of the ways I used some of my bountiful basil plant up. Enjoy! To start, one way to use a lot of basil at once is to make pesto refer back to my entry Pesto! Pesto! for that particular recipe. You’ll also find another fantastic use for pesto there 🙂 See, my love for basil is not new found. A classic recipe that you can never go wrong with. 2) Cook on a griddle until cheese is good and melted. Make sure you flip it so both sides of the pita get toasted. It’s really that easy. Tastiest, best, quick dinner ever. One note, spend the extra few bucks to get the freshest mozzarella you can, you won’t regret it. Little fact, did you know that gnocchi can be made with potato or ricotta?? I’d like to try making it with ricotta sometime, I’ll let you know how it turns out if I ever get around to it. So if you are anything like me you always make more food than you need. Especially if you are always cooking for one person. Well the wonderful thing about gnocchi is that it easily freezes! Just lay out the gnocchi in a single layer on a cookie sheet on a sheet of wax paper and then freeze them. Once they are frozen just put them in a freezer bag and pull out as needed. No need to defrost either. Complicated homemade gnocchi becomes simple homemade gnocchi. Brrr it's cold in here! 1) Toss gnocchi with pesto. 2) Toss gnocchi with tomato. 3) Sprinkle with mozzarella shreds. An elegant simple recipe to impress a date with 🙂 Don’t forget the garlic bread! I’m a HUGE fan of white pizza, and unfortunately DC isn’t really known for having white pizza, or at least not how I like it. Yes, I am being a bit of a princess… Anyways I have a feeling you won’t be offended by my princess attitude of having pizza a particular way once you try this pizza. 1 pilsbury pizza crust, it’s in the refrigerator section. 3) Layer with spinach leaves. Sprinkle on mozzarella cheese. Add on other toppings of red pepper, broccoli, and tomato. Sprinkle with feta cheese. 4) With a pastry brush, brush the olive oil mixture on the outer crust. Bake for about 18-20 minutes. I like to imagine I’m eating healthy when I have this pizza. I mean look at all the veggies on there! At this moment I don’t have a picture of this refreshing creation, but I promise to post one as soon as it is made again. 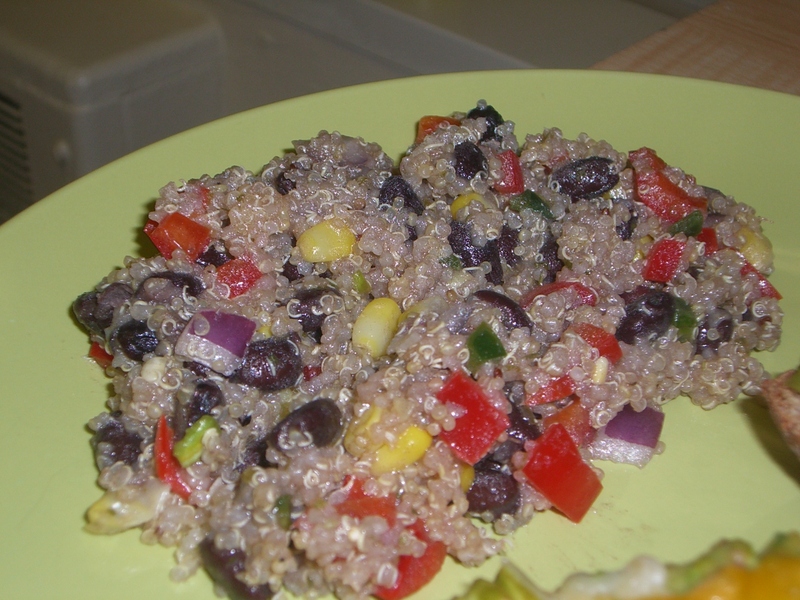 This recipe is a creation of guest writer Scruffy Bear. It’s a sweet way to take advantage of the bountiful produce of summer. 1) Heat water and sugar in a sauce pan to make a simple sugar syrup. 2) Place chunks of watermelon and basil in a food processor or blender. You may have to do this in batches. Pour in your simple sugar syrup, let your kitchen appliance do it’s work. 3) Pour blended watermelon mixture into a large bowl. Place in freezer for about 1 hour to chill. You don’t want it to freeze completely. 4) Pour into cups and serve! mmmm refreshingly good! ALTERNATE USE: If you feel in the mood for a granita instead, pour the blended watermelon mixture into ice cube trays and let it freeze. Once frozen give the cubes a quick blend in a food processor or blender to give it a more water ice texture. Well friends, that concludes our many adventures with basil! Tune in later for Bubba Burley’s Curry. Enjoy! My sister the other day was sorely disappointed that I had breakfast items missing from my food recipes, and I agree with her. The things is, my favorite breakfast items are not cooked by me so I forget to pester who make them for the recipes so I can post them. Well folks, the wait is over. Breakfast is making its appearance on Fatty Bear’s Delights and we are starting with…. Either A…pestering for pancakes at every moment…. I think you get the picture. Anyways, You will not be sad with the pancakes below so what are you waiting for?? Get in the kitchen and whip up a batch now. Woo that fatty bear in your life. Your favorite cake in breakfast form! In a bowl, combine flour, pecans, baking powder, cinnamon, salt, ginger, and nutmeg. In a separate bowl, combine egg, brown sugar, milk, carrots, and vanilla; mix well. Stir carrot mixture into dry ingredients until moistened. Pour batter by 1/4 cupful onto a greased hot griddle. Turn when bubbles form on the top of pancake; flip and cook until golden brown. For topping, blend cream cheese, powdered sugar, milk, and vanilla until smooth. Sprinkle with cinnamon, and serve with pancakes. Helloooo! I know, it has been super long since I have posted, but I have lots of pictures on my camera just waiting to be uploaded and written about (hopefully I remember how I made the dishes!). Toss all the ingredients, obviously not the wrap, together. Layer in center of wrap. Roll up wrap and enjoy! Don’t you love the simplicity?? Cook bruschetta burger according to package. Toss other ingredients together. Layer on wrap, with burger on top. Wrap up, enjoy!! There you have it! Two unique wrap reciepes that can easily be prepared in less than 10 minutes! I hope you enjoy the quick wraps. I’ll try to be less of a stranger.